Looking for transportation from Orlando International Airport to the Walt Disney World Resort for your vacation? Disney provides a shuttle service known as Disney’s Magical Express for registered guests of their resorts. Read on to find out 10 things you need to know about the Disney’s Magical Express. 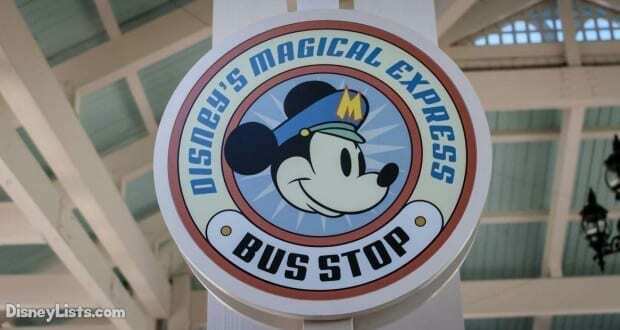 Disney’s Magical Express is a complimentary service for all Walt Disney World Resort guests. There is not an additional charge to use this service and it does not matter if you have a package or a room only reservation, any registered guest can use it. Please note that Disney’s Magical Express does not service any of the Hotel Boulevard Resorts near Disney Springs, Shades of Green, The Four Seasons or The Walt Disney World Swan and Dolphin. Guests staying at one of these resorts will need to arrange for alternate transportation. Disney’s Magical Express provides complimentary service from Orlando International Airport to the Walt Disney World Resort. Be careful when booking your flights as some airlines do fly into the Sanford/Orlando airport. This airport is about 45 minutes north of Walt Disney World and you will need to either rent a car or hire private transportation from this airport. Before you leave home you will receive a set of yellow luggage tags. These are similar to the types of tags the airline will put on them. By placing the yellow tags on your luggage, the airport will pull your bags after it is unloaded from the plane. 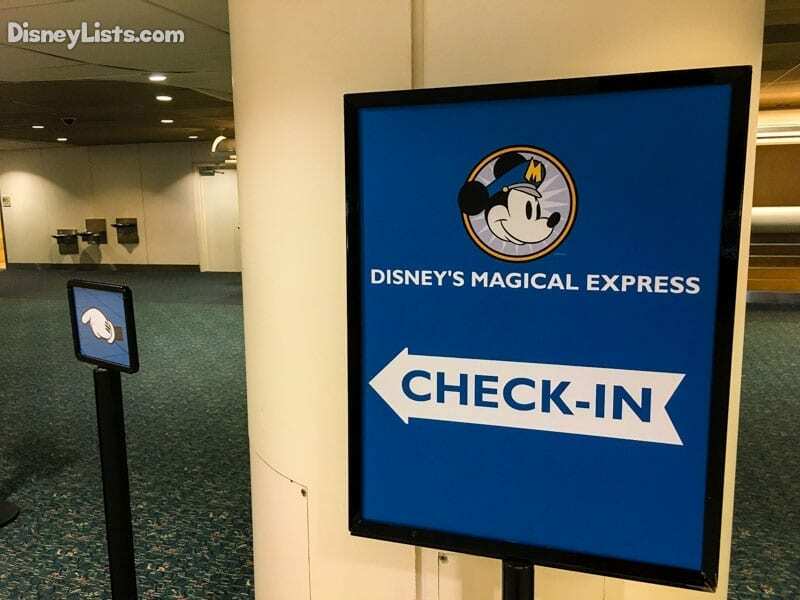 There is no need to visit the baggage claim and you can head right to the boarding area for Disney’s Magical Express! Once you arrive to the resort it takes approximately 3 to 5 hours for your luggage to be delivered. Behind the scenes at the airport your luggage is pulled before it reaches the baggage claim, then it is sorted and sent on trucks to Walt Disney World. Each truck may have several resorts to stop at. Once it is at your resort, your Bell Service Cast Members will deliver the luggage to your room! There is no need to be in the room for them to deliver it. Delays can occur due to weather so keep in mind that there is that 3 to 5 hour window for delivery. Usually the luggage arrives around the 3-hour mark. Also be sure to pack in your carry on any items you will need right away before your luggage arrives. If you would rather take your luggage with you and not have it transferred by using the yellow tags, simply discard the tags and pick up your luggage as normal at the baggage claim. Your luggage will be stored under the motorcoach and you will have it immediately at the resort. If you arrive before your room is ready Bell Services can hold your luggage for you until the room is ready. If your flight is arriving after 10 pm you will not be able to utilize the yellow tags and will need to pick up your luggage at the baggage claim and take it with you onto the motorcoach. Additionally if you are waiting at the resort for your luggage to arrive be sure to let Bell Services know you do want it to be delivered, even if it is late. The day before your check out you should receive your transportation notice hanging on your door. This letter should have each of your party members listed, your flight information, and a motor coach date and pick up time. If any of this information is missing or is incorrect you will need to stop by the front desk with your flight information for assistance. Do not lose this transportation notice as you must have it with you to board Disney’s Magical Express. Your Magicbands cannot be used to board the motorcoach. There are two options for luggage on your return trip. If your airline is a participating airline for Resort Airline Check in and you are on a domestic flight you can check in your luggage at the resort and not see it until you reach your final destination. This service is open from 5 am to 12 pm daily. You can also pay baggage fees and get your boarding passes at this location. Each adult in the party must have a photo ID. You can store carryon items at Bell Services until it is time to board the Disney’s Magical Express. If your airline does not participate in Resort Airline Check in or you simply want to take your luggage yourself you can store items at Bell Services until it is time for your pick up time. Then you will take your luggage with you onto the motorcoach and drop it at your airlines bag drop at the airport. Your Disney’s Magical Express pick up time should be approximately 3 hours prior to your flight departure for domestic flights. International flights should have pick up times approximately 4 hours before your flight. It is not possible to schedule a later pick up time, you can however go earlier if you would like. The 3 hours prior is to ensure that Disney can get you to the airport in time for your flight. 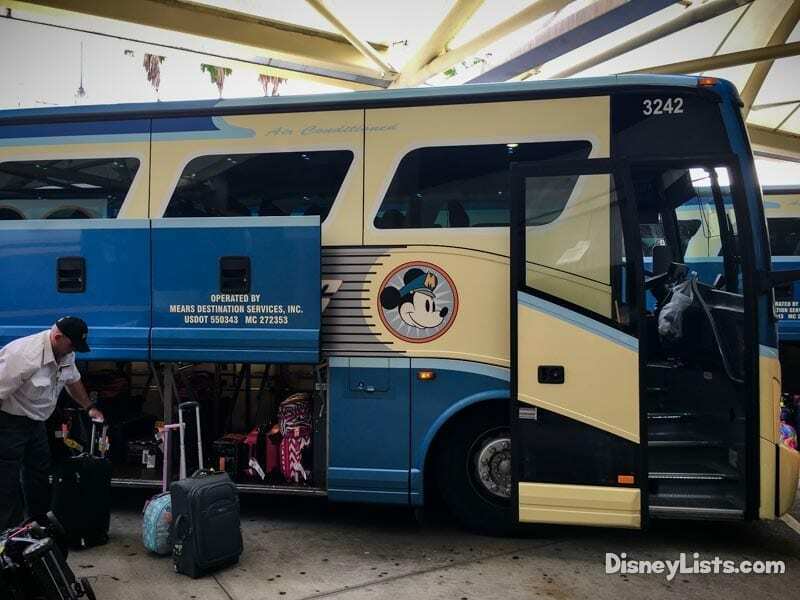 Keep in mind that the motorcoach may stop at multiple other Disney Resorts, and that it is approximately 45 minutes to the airport depending on traffic. It is recommended that you arrive at the pickup location 15 minutes prior to your pick up time. If you are using the Resort Airline Check in service be sure to give yourself 30 to 45 minutes to check your luggage depending on how busy it may be. If you miss your scheduled pick up time it is likely you will need to take a taxi at your own expense. The Magical Express only picks up guests who are scheduled, so it is quite possible that there may not be another scheduled pick up at your resort for over an hour. Additionally if another bus is scheduled to arrive it might be full as the driver knows how many open seats he may have. Disney’s Magical Express is a free service that takes you from the Orlando International Airport to Walt Disney World and will return you to the airport for your departure. This service makes it easy for you to start your vacation without the hassle of spending time at the baggage claim and the stress of driving a rental car. Be sure to take advantage of this service on your next trip! Jenn is a Pennsylvania native whose love of Disney caused her to move to the Sunshine State. As a child her family visited Walt Disney World every year on vacation and now that she calls Orlando home she frequents the Disney parks often. Jenn loves all the wonderful dining experiences on property and can't wait to try anything new. In her free time she loves spending time with friends, cooking and visiting other Orlando attractions and restaurants.